George was born to a Greek family in Asia Minor or the Middle East in the 3rd century and, according to legend, became a soldier in the army of the Roman Emperor Diocletian. When he refused to reject his Christian faith and make sacrifices to the Roman gods he was tortured and beheaded, possibly in Nicomedia, an ancient Greek city now buried under the modern city of Izmit in western Turkey. Through the marvellous convolutions of history he is now the patron saint of England. His reputation rose via the Crusaders in the 11th and 12th century. He was seen – honest ­– aiding Crusaders at the Battle of Antioch in 1098 and was made a patron saint of soldiers. It wasn’t until the reign of King Edward III in the 14th century that he became England’s patron. Some of the supposedly traditional recipes in Schuegraf’s book have no other presence online beyond people making his, but looking up this one, various versions appear. Some are made with grape molasses instead of all the sugar used here, and oil instead of butter, but all feature a broadly similar combination of ground or chopped nuts (usually walnuts), citrus, spices, and a splash of booze in the syrup. I’ve had a note in my diary to make this the past few years as I love cake batters featuring nuts, and semolina, and drenched in citrusy syrup. Like my favourite nutty cakes torta Caprese and Sachertorte, it’s made by separating eggs, then using the whisked egg whites to lighten the batter. In this case, there’s also a load of chemical raising agent too. I’ve tweaked the recipe a bit. 1. Grease and line a 25cm cake tin, and preheat the oven to 180C. 2. Cream together the butter and caster sugar until soft and light. 3. Lightly beat the egg yolks, plus the 1 whole egg, then add gradually beat into the creamed mixture. 4. In a separate, clean bowl, beat the egg whites to stiff peaks. 5. Sieve together the semolina, flour, raising agents and spices and add to the mixture. Also beat in the nuts. 6. Beat in a little of the egg white to lighten the mixture slightly, as it’s quite stiff, then gently fold in the rest. 7. Put the mixture in the prepared tin and bake for about 50 minutes, until firm to the touch and a skewer comes out clean. 8. While it’s baking, make the syrup. Combine the sugar, water, zest and juice, and the cinnamon stick in saucepan and gradually heat up to the dissolve the sugar. I used a Sicilian blood orange, which was particularly pleasing. 9. When the sugar is dissolved, simmer the syrup, reducing the mixture by about a third. 10. When the cake it baked, remove from the oven and leave in the tin to cool slightly. 11. Take the cake out of the tin and transfer to a plate or platter with a rim, to contain the syrup. 12. Pour the syrup over the cake and let it soak in. Serve warm or at ambient temperature. Enjoy, preferably on a sunny afternoon with a lot of friends – it’s a fairly substantial cake! In the autumn of 2011, I noticed bags of a yellow-ish powder on a stall in the farmers’ market in the Ex-Mattatoio in Testaccio, Rome. It was farina di castagna – chestnut flour. That is, flour made from the dried and milled nuts of Castanea sativa, the sweet chestnut tree. At the time, I experimented with it. A friend commented that there is in fact a traditional Italian bread made with chestnut flour, called pane di San Martino, or St Martin’s bread. The feast day of St Martin is 11 November, just around the time the year’s chestnut flour becomes available. Anyway, I mentioned this bread to a teacher who I was doing a (food-focussed) conversation class with. She dug out a recipe. Well, she clearly Googled a recipe, as a quick Google myself soon found her source, which is here (in Italian). After having gone through all that, I then completely failed to try the recipe. A year went by, autumn returned – and so too did the chestnuts, and chestnut flour. So last week I bought a new pack, and determined to revisit the pane di San Martino recipe. Firstly, however, I had to translate it. 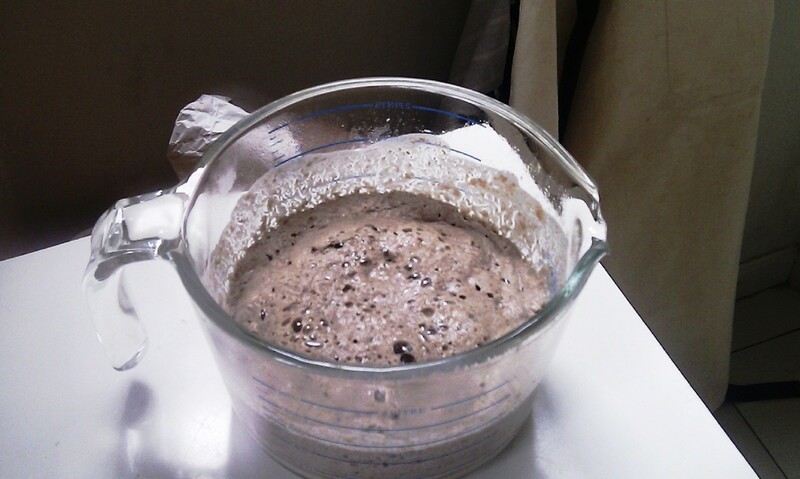 Anyway, I translated and converted the recipe, but it still wasn’t quite right in terms of the liquid/dry quantities, so I also revised it while making the dough. Indeed, all flours have different absorbency, so you will have to have a feel for dough when you’re adding mixing the water and flours. This time, I used an organic, stoneground farro bianco – white spelt – flour from the renowned Marino Mulino. 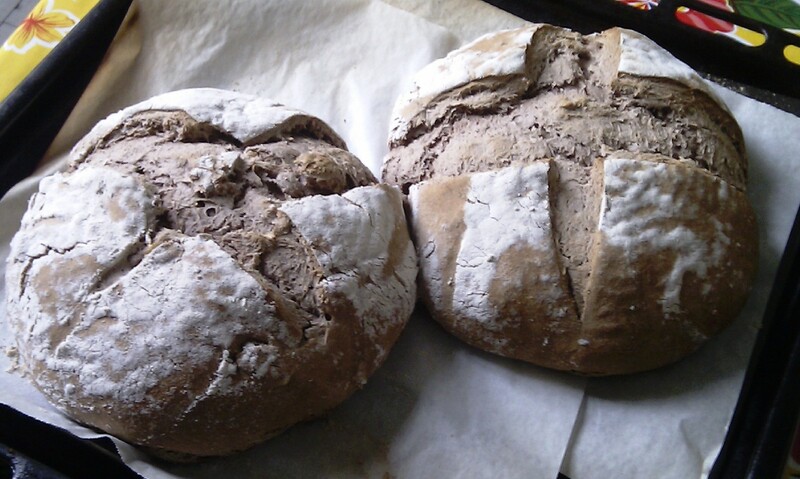 If you use a wholewheat flour it will require a more water than a white flour. So. Pane di San Martino. My teacher gave me some notes that said this bread is found from Emilia-Romagna in north Italy to Salento, in Puglia, the heel. I’ve never seen it in Rome though. In fact, I’ll come clean and say I’ve never seen it anywhere, in the crumby flesh. So although my version is based on an Italian recipe, my version has no claim to authenticity. Which might upset an Italian baker, but shouldn’t be a problem if you stumble upon this recipe from other climes. The recipe uses both a leaven (sourdough culture) and fresh yeast. This is a technique used by one of my favourite bakers, Dan Lepard, though it might upset some purists. OK, purists, that’s two warnings now. Cover and leave to ferment for around two hours. 300g water. Add more if the dough feels too tight. Combine with a spoon or spatula. You want a moist dough. Don’t be afraid to add more water. When it’s a good consistency, knead to combine. Cover and leave to rest for 10 minutes. 180g walnuts and knead gently to combine. Weigh the dough and divide in two. Form two balls, then leave these to prove in baskets or bowls lined with flour clothes. Leave to rest for around two hours in a warm place away from draughts. Timing will vary depending on the temperature of where your prove the dough. When the dough feels springy and alive, almost jelly-like, you’re ready to bake. Gently upturn the proving baskets/bowls onto the baking sheet. Bake for 20 minutes, then reduce the temperature to 200C and bake for a further 20 minutes. 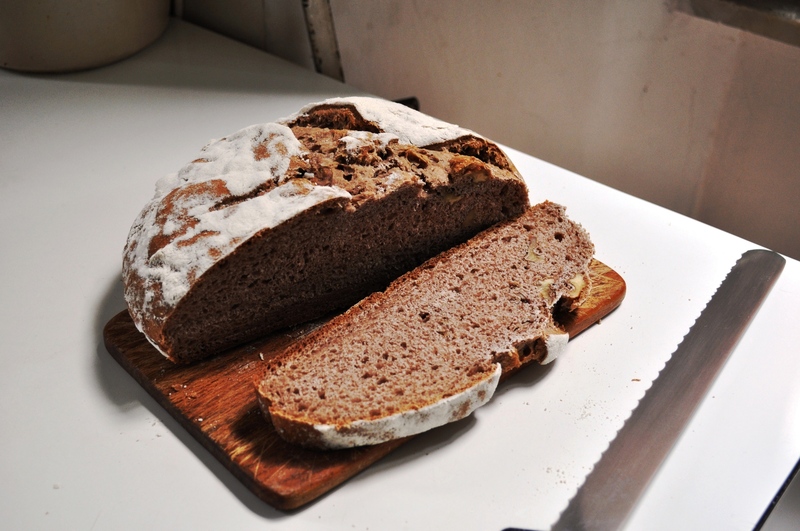 The resulting bread is sweet, almost cake-like, and pleasant for breakfast or afternoon tea, and makes good toast when it’s aged past its initial softness. Later on, he writes more about the importance of chestnut trees for “the principle necessities of life”, from building materials to food, specifically castagnaccia, “what had been a stabple food that most old contadini [peasants] now wanted to forget they had ever eaten, because of the memories it brought back of long years of poverty.” Interestingly, the suffix -accio / -accia often indicates a perjorative, so castagnaccia could be translated – very loosely – as “yucky chestnut bread”. Sign up here to receive email notifications about new entries. Thanks! Bread, Cakes And Ale · A celebration of bread, cakes, beer, and grain-based foods.